Five players including Cole McDonald from Hawai’i, Mason Fine from North Texas, Tyler Horton from Boise State, Ed Oliver from Houston, and Darrynton Evans from Appalachian State have been selected as the College Sports Journal All-Stars for the week ending Sept. 3, 2018 from the NCAA Division I FBS Group of Five schools. Cole McDonald, QB, Hawai’i, Soph., La Mirada, Calif.
McDonald completed 30-of-41 passes for 428 yards and six touchdowns in Hawai’i’s home opening 59-41 win over Navy. The six passing touchdowns are the most by a Mountain West quarterback since Nov. 14, 2015 (Fresno State’s Zack Greenlee), and the most by a Rainbow Warrior since 2013. This performance backed up a Week 0 win at Colorado State where he threw for 418 yards and three touchdowns, while rushing for 96 yards and two more scores. Fine hit a career-high 40 of 50 passes in the Mean Green’s 46-23 win over SMU for the most completions in a FBS game. His 444 passing yards were a weekend best and ranks No. 2 nationally this season to the 537 by Colorado State’s K.J. Carta-Samuels losing effort against Hawaii on Aug. 25. This was the second 400-yard performance of Fine’scareer and ninth in school history. Tyler Horton, CB, Boise State, Sr., Fresno, Calif.
Horton only notched four tackles but recovered two fumbles, both of which he returned for scores, in Boise State’s 56-20 victory at Troy. The two fumble returns for touchdowns tie a FBS single-game record. Horton scored his first touchdown with a 55-yard fumble return in the third quarter, then added an 11-yard fumble return in the fourth. Horton began the game by deflecting a screen pass, which was then intercepted by linebacker Tony Lashley. 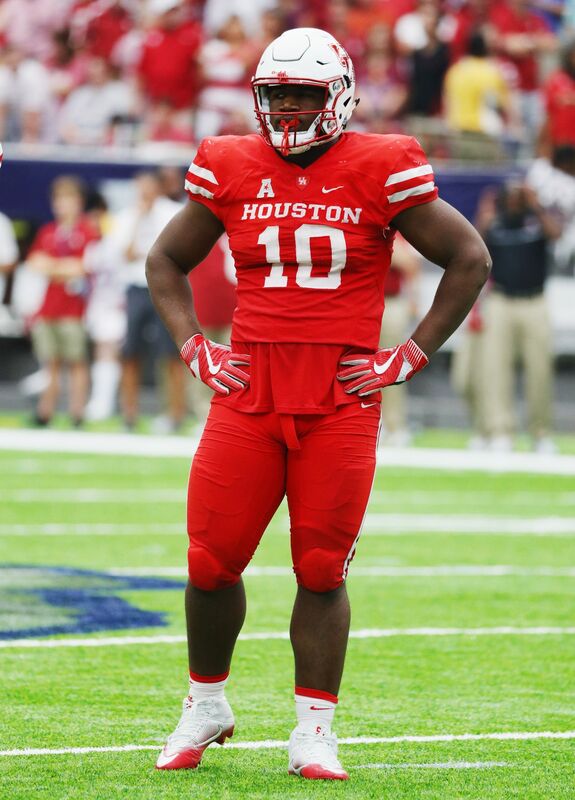 Ed Oliver, DT, Houston, Jr., Houston, Tex. Oliver, a preseason hopeful on the defensive side for the Heisman Trophy, finished with a game-high 13 tackles, including 3.5 tackles for loss, with two quarterback hurries in Houston’s 45-27 win against Rice. The 13 stops are the most by an AAC player in Week 1. Darrynton Evans, RB/KR, Soph., Appalachian State, Oak Hill, Fla.
After missing all of 2017 due to injury, Evans made his dynamic presence felt immediately with a first-quarter kickoff return of 100 yards to answer Penn State’s initial touchdown drive and tie the score at 7-7–ultimately the Mountaineers lost 45-38 in overtime. It was the second 100-yard kickoff in program history. It was App. State’s first kickoff return for a TD since Evans himself had a 94-yard return in the 2016 Camellia Bowl. It marked two touchdowns in a span of three returns for Evans, as he had a 14-yard return after his 94-yard return in the bowl game. – Evans piled up a game-high 149 all-purpose yards (9 rushing, 10 receiving, 130 kick return).